An investment in the right technology is a smart one and pays off quickly by increasing customer or audience engagement with the information you’re presenting. BMC, Inc. has the expertise to help you choose the right solution for your specific needs. Our team is available to discuss your presentation needs over the phone or in-person and has the knowledge and experience to help you find the presentation devices that are right for you. Increase the effectiveness of your communication with a Sharp Interactive Display. Draw right on the screen and control your presentation with software-driven pens that let you present your message with ease. Or use your fingers, giving you complete and natural flexibility and control. It’s like combining the power of a computer with a whiteboard. And, it’s as easy to use as a pen and paper. These displays are perfect for people and teams who want flexibility when they present. They’re also ideal for generating ideas. Teachers, trainers, boardroom presenters, marketers, and salespeople find them particularly useful. Mark up presentations. Modify plans. Make changes to product designs. Then save it all to USB devices or email it to the meeting participants or other colleagues instantly. Imagine being able to have immediate access to a universe of information while presenting and complete freedom to interact with your information. Express yourself by writing your insights and ideas, just like you were using pen and paper. When connected to an MFP, you can scan documents directly to the display for instant presentation and annotation, make your changes, and instantly distribute new electronic or hard copies. 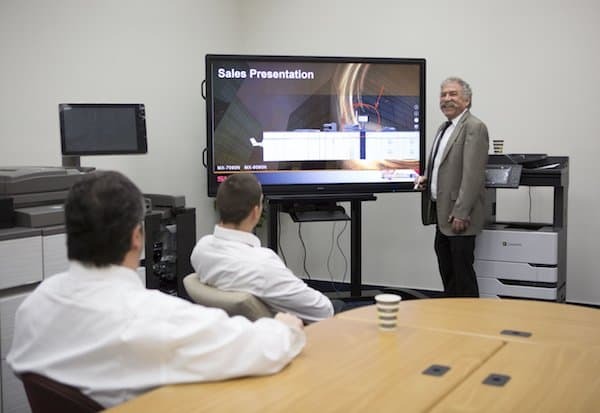 Our Sharp Interactive Displays are easily connected to your office network and are available in a wide range of sizes to fit any size room; 40, 60, 70, and 80 inches (measured diagonally). If you don’t need all the functionality provided by interactive displays, or if you are you looking for signage for your business, a flat panel professional display may be the right choice for you. Sharp Professional Displays are available in a wide range of sizes, configurations, and resolution levels. 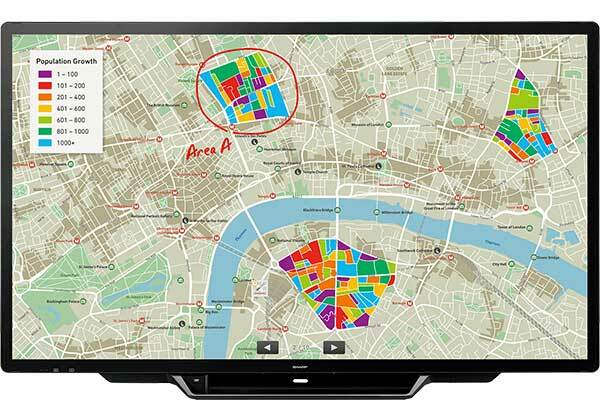 They can display virtually any type of information including Powerpoint Presentations, text, images, videos and much more. Mounting options include wall, pedestal, desktop, and flat (horizontal or at an angle). Our flat panel displays are specially engineered for continual use that businesses require. They are simple to install and are easy to connect to information feeds, computers, and other storage devices. They can even be joined together in a “video wall” configuration for an inspiring and impressive presentation. Unique slim bezels, either black or mirrored, make the wall appear seamless. Contact BMC today to get more information on how your company and employees can benefit from Sharp presentation devices or call 818-787-2622. If you prefer, click on the solution links to learn more about our different presentation device offerings.